The beautifully detailed blossom on our Charming Floral table cards are so realistic in design, you'll expect to get a whiff of their perfume. Brilliant purple flowers adorn a corner, depicted with striking three dimensional details. 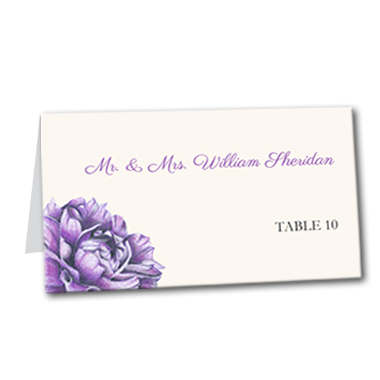 Coordinating lettering features your names in purple as well in graceful cursive for a romantic feel fitting of spring weddings. Charming Floral Table Card For the best experience, we recommend personalizing your stationery on a desktop computer.